Bushnell Trophy Cam 16MP HD Essential E3 Trail Camera, Brown is one of the most-talked-about products in the market for its features that make documentation of the Wild a lot easier and of excellent quality. It has speedy responses and capability to capture even the swiftest movements of the animals and the most accurate detail of the scene which is viewable through high-quality resolution. Bushnell Trophy Cam 16MP HD Essential E3 Trail Camera, as its name implies, is characterized by its 16 MP resolution that enables it to take videos and photos of excellent 720p quality. The trigger speed of this camera, which is 0.3 seconds, is one of its features that buyers have loved the most. This hunting camera utilizes the Time-Lapse shooting mode through Bushnell’s Field Scan 2x, enabling users to capture images at different intervals and observe notable changes in movements and time intervals. It has a feature that allows one to capture videos with the length of 5-60 seconds, according to what he or she may want or demand. Bushnell Trophy Cam 16MP HD Essential E3 Trail Camera has a passive infrared sensor, automatically and immediately capturing images when movement is detected– as long as it is within a 100-feet distance. The sensitivity of this product may also be adjusted into low, medium or high– and on top of that, it can also be set on automatic for lesser work and human intervention in the process of documenting. As for this camera’s night vision, it features 32 LEDs and Hyper Night Vision Technology, along with an efficient flash range of 80 feet.With this feature, users can still have good after-dark images which can be documented and used for studies and observations. Another well-loved highlight of this hunting camera is its Essential E3 which has an automatic sensor that adjusts exposure correctly, depending on whether the user captures photos in broad daylight or the dark. It is also possible for this product to set it in multi-image mode, letting you capture 2-3 images at a time. This high-quality and excellent-performing camera runs using eight pieces of AA batteries and can hold an SD or SDHC card of 32GB. As for its other features that do not concern the camera itself, users may hang this camera with the use of a tree mounting strap and also extend it with the help of a ¼ inch 20-threaded mount. Like many other hunting cameras, you may also set the camera up into having a stamp indicating the time, day, date, temperature and moon phase. The distance it can capture is quite large-spanning, and the resolution to which it records videos and images is very efficient for anyone aiming to study and observe the Wild. It has many features which you can set in automatic (PIR sensor, sensitivity), which is a helpful tool for the newbie users of this kind of camera and even to those who are new to the field of documenting images and videos in the Wild. This feature is also beneficial to those who want to capture the best photos yet do not know how to allow the camera to do so. Its low LED count makes it less noticeable for animals and other people to notice it even in the dark. Its automatic capturing of videos and photos upon motion detection opens up a disadvantage, especially if it will be intently left in the wild. With this feature, the camera may shoot for images and videos which may not even be the one you want to take a photo of and waste away the energy or the power as well as the memory it will occupy in your memory card. As the camera documents HD images and videos, it will fill quite a large amount in your memory– and a 32-GB memory card could not guarantee to capture as many as you want or need to. Its strap which can be used as an extender to the camera as it attaches itself to the trees (from which the perspective or point-of-view of the camera will come) cannot guarantee sturdiness and security as it is strapped. 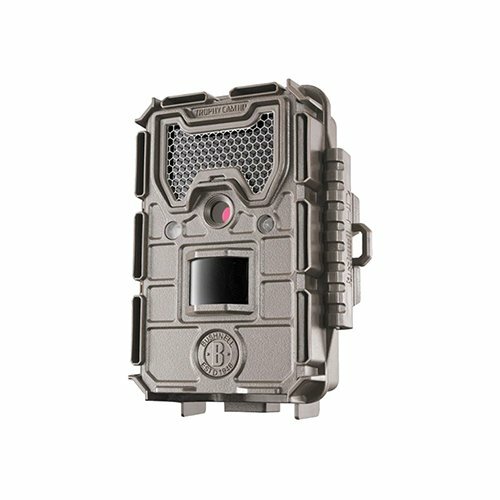 Overall, the Bushnell Trophy Cam 16MP HD Essential E3 Trail Camera is characterized by many features that many game cameras have– except that they have a different and, not to mention, unique attack on the needs and demands of many customers in the market. This product enables users to have a flawless and efficient experience in recording observations through visuals like videos and images with the settings which can accommodate both professionals and newbies alike. The disadvantages that come with the product are some that users can work on through constant and consistent control and through purchasing other equipment or products which are available in the market or can be improvised.